Matt Mullican, Untitled (Pantagraph), 2016, Acrylic, gouache, and oil stick rubbing on canvas, 78.75 x 157.5 inches. Rhona Hoffman Gallery is pleased to open 2019 with Signs and Systems, an exhibition curated by Anne Rorimer featuring works by Lawrence Kenny, Allan McCollum, Matt Mullican, and Caroline Van Damme. In different ways, each artist generates visual signification by means of systems predicated on line, color, shape, and form. Together they call upon the potential of these basic visual elements to invest flat surfaces and/or real surroundings with abstract aesthetic meaning. Serial systems play a strategic role in two works by Lawrence Kenny. In Is You Is or Is You Ain’t My Baby (2018), primary and secondary colored letters appear to float just above the wall, repeatedly spelling out the title of Louis Jordan’s famed 1944 song to form an overall pattern of successive columns within a large rectangle. In marked contrast, Wirework (2017) addresses the attempt to perceptually imbue empty space with palpable form. The pairing of eight bent, thin, three-foot long, steel wires in four different positions serve to interconnect the neutral planarity of the wall with iterations of spatial depth. Matt Mullican’s Untitled (Pantagraph) (2016) is a single example of the artist’s multi-pronged aesthetic project noted for its incorporation of sign systems. Through a broad range of media, Matt Mullican draws from his own subconscious to create a body of work aimed at nothing less than to make sense of the universe. 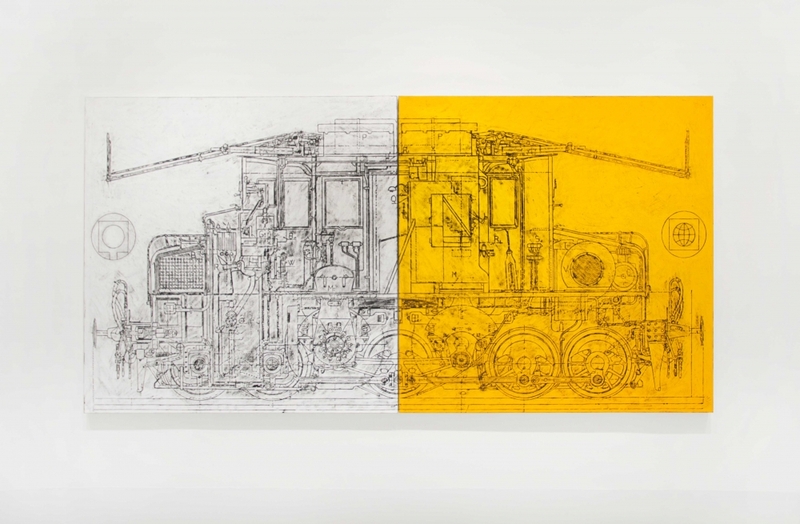 Untitled (Pantagraph), a two-part rubbing on canvas presents an image that simultaneously signifies vehicular locomotion and architectural stability: a building on large wheels is suspended, as if indefinitely going both elsewhere and nowhere. It exists as part of a mysterious composite image on the flat, rectangular plane of painting where the otherworldly is able to feature its own representational reality. None of the 144 differently colored, irregular shapes comprising The Shapes Project: Collection of Seventy-two Perfect Couples (2014) by Allan McCollum are the same. They are paired as part of a series displayed in relief on 72 square backgrounds. Arranged in rows one above the other, the paired shapes are contained within an overarching grid. As a group, they speak to the notion of the infinite variety of formal possibility that may be played out within a definitive, but nonetheless limitless, aesthetic field. The thin, elongated Horizons by Caroline Van Damme allow spare, yet vibrant, pictorial statements to intersect with spatial reality. Vertical or horizontal elongation, atypical of the traditionally shaped rectangular canvas, provides a rhythmical give-and-take between linearity, enhanced by color, and the otherwise blank, white background of the wall. Elongation and linear systems of demarcation punctuate the reality of the surrounding space in which the Horizons markedly participate either as a group or individually. By joining these four artists together, guest curator Anne Rorimer creates an exhibition that suggests the potential of refined systems of abstract signification to create meaning in real, physical space. Anne Rorimer is a Chicago-based curator and renowned art historian specializing in art after 1965. She began her career at the Art Institute of Chicago as a curator in the Department of 20th-Century Painting and Sculpture in the 1970s and 1980s. She was co-curator, with Ann Goldstein, of Reconsidering the Object of Art: 1965-1975, held at the Museum of Contemporary Art, Los Angeles in 1995-96, and co-authored the companion publication. She is the author of New Art in the 60’s and 70’s: Redefining Reality (Thames and Hudson, London, 2001/2004) and has written numerous articles for exhibition catalogues and periodicals in Europe and the United States. Lawrence Kenny was born in New York City, where he currently lives and works. For decades he has maintained active practices as both an artist and architect, turning solely to artmaking in 2008. Kenny’s work has been exhibited at the Art Institute of Chicago; 80WSE Gallery, NYU, New York; 55 Mercer Gallery, New York; the Arts Club of Chicago; the Schelfhaudt Gallery at the University of Bridgeport, Connecticut; and in many group shows at the Onetwentyeight Rivington Gallery, New York. As an architect he has worked on art installations and remodelings for museums, galleries, and architectural landmarks, including The Art Institute of Chicago; The Renaissance Society, Chicago; Robie House, Chicago; Yale University Art Galleries, New Haven; Neue Galerie, New York; and Lincoln Center, New York. Allan McCollum was born in 1944 Los Angeles, California, and lives and works in New York City. His work is in over seventy museum collections, including the National Gallery of Art, Washington, D.C.; the Museum of Modern Art, New York; the Guggenheim Museum of Art, New York; The Metropolitan Museum of Art, New York; the Whitney Museum of American Art, New York and the Los Angeles Museum of Contemporary Art, Los Angeles. Solo retrospectives of McCollum’s work have been held internationally at the Musée d‘Art Moderne, Villeneuve d’Ascq, Lille; the Sprengel Museum, Hannover; and the Serpentine Gallery, London. He has produced public art projects in both the United States and Europe. His work was also recently included in the 9th Bienal do Mercosul, in Porto Alegre, Brazil, curated by Sofía Hernández Chong Cuy. Matt Mullican was born in Santa Monica, California, in 1951 and lives and works in Berlin and New York. Recent solo museum exhibitions include Pirelli HangarBicoccia, Milan (2018), Camden Arts Center, London (2017), Kunsthall Vogelmann, Heilbronn (2016), Kunstmuseum Winterthur (2016), Museo Tamayo, Mexico City (2013), Haus der Kunst, Munich (2011), and Institut d’Art Contemporain, Villeurbanne (2010). The artist's works are held in major public collections including Museum of Modern Art, New York; The Whitney Museum of American Art, New York; Musée National d’Art Moderne - Centre Pompidou, Paris; Fonds National d’Art Contemporain, Paris; Museo National Centro de Arte Reina Sofia, Madrid; Castello di Rivoli, Turin; and Kunstmuseum Luzern, Lucerne. A major exhibition Matt Mullican: Living in That World opens March 2019 at the de Young Museum in San Francisco. Caroline Van Damme was born in 1955 and lives and works in Brussels. She studied clinical psychology at Université Catholique, Louvain, and visual arts at schoolBXL Art School, Brussels. Her work has been included in exhibitions at Galerie De Ziener, Asse; MHKA (Museum of Contemporary Art), Antwerp; White-Out Studio, Knokke-Heist; CCNOA Art Centre, Brussels; The Arts Club of Chicago; Winterthur Kunstmuseum; Museum Dhondt-Dhaenens, Deurle; Santa Monica Art Centre, Barcelona; Palais de Beaux-Arts, Brussels; and Genesta, London. She currently teaches aesthetics, philosophy, and psychoanalysis at ERG (École de Recherche Graphique), Brussels.